dance.net - time to add the next layer of bling. Ideas? (10083912) - Read article: Ballet, Jazz, Modern, Hip Hop, Tap, Irish, Disco, Twirling, Cheer: Photos, Chat, Games, Jobs, Events! time to add the next layer of bling. Ideas? It's time to add more crystals to my solo dress. There are so many different options, I thought I'd come to the excellent blingers of DDN for your opinions. My thought was to add stones around the waist. I could do the same pattern as the neckline, with a double layer of stones. I could use the next size larger and do a single layer. What do you think? Currently I have the large stones you see in the picture, and I have smaller clear stones in the white embroidery. 22 Replies to time to add the next layer of bling. Ideas? re: time to add the next layer of bling. Ideas? 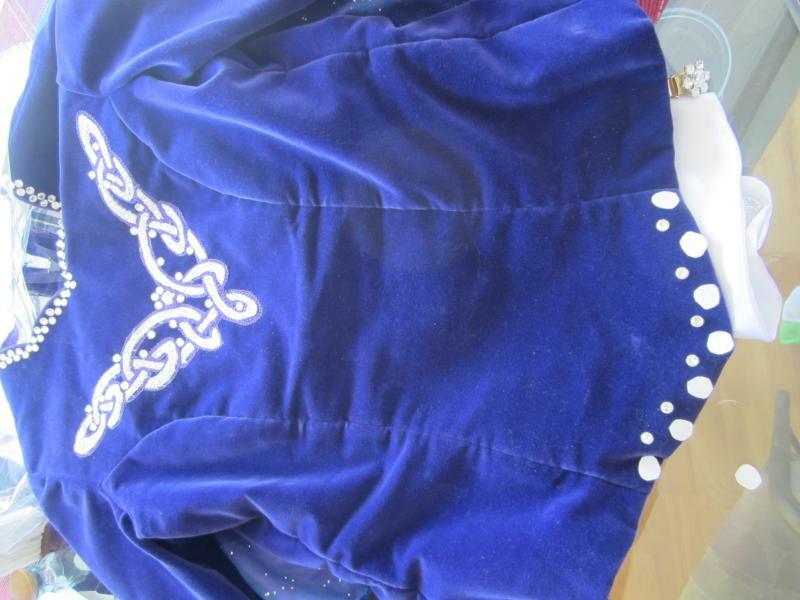 A- buy some small crystals and literally just outline the embroidery on the bodice. Since it's white against blue, it pops already, but the small crystals would just make it EXPLODE! B- add a belt to the skirt along the bodice. I would do double, maybe even triple rows. I would do them like how it's done on the neckline. C- buy several sizes of blue crystals and just scatter those bad boys everywhere. Along the bodice and sleeves, and on the skirt for sure. I really really like Saoirse's ideas, I think that would be gorgeous! I have another one for you, but that may be very bold, so it depends on what you like. You could incorporate big teardrop crystals to the white embroidery that you already have, and continue the design only with the stones (the big teardrop ones and maybe some small round ones) to extend the design a little more towards the bottom of the bodice! I think that could be great, but since I am not the best at visualizing, I'm just not sure if it would be too bold with the skirt. I love the color of this dress - it is so flattering on you! 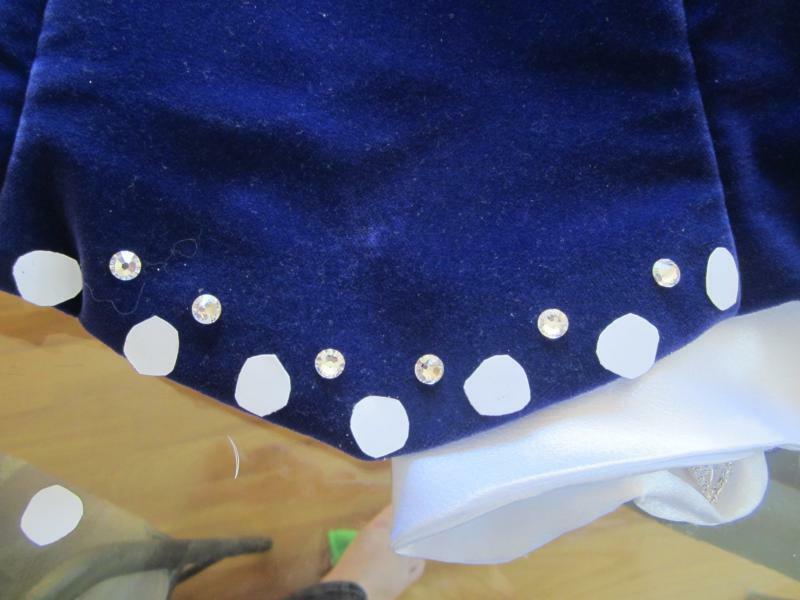 Definitely bling up the bottom edge of the bodice. Try two or three layers of checkerboarded large stones like you have onthe neckline. 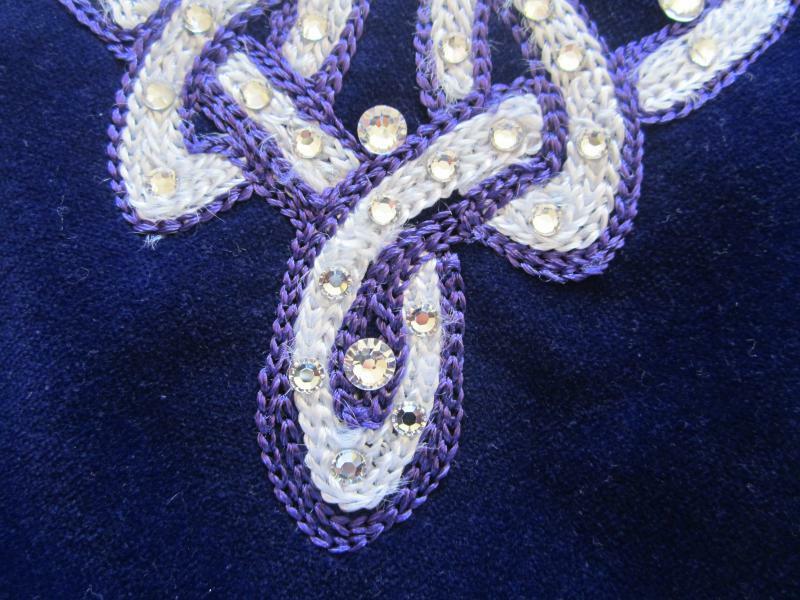 I second saoirse's idea of scattering blue stomnes on the velvet - try "sapphire" if you use Swarovski. I think it would look good if you do the scatter where they are more concentrated/denser towards the center - around the embroidery and scattered down the center front - and then they scatter spreads out towards the sides. sort of like this: www.dance.net . . . If I do the double or triple layer around the bottom of the bodice, do I go all the way around, or just from the side seams forward? ^I'd go all the way around. It's time-consuming so maybe do one row all the way around the bottom of the bodice for now, and then do a 2nd row when you have time. Your dress is beautiful. I do like Saoirse3473's idea re scattering the blue crystals too. I think a few scattered blue crystals either on bodice of skirt would look really great but would be subtle and elegant. You get the flash without the polka dots. having too much fun with photoshop! I tried to give you a visualization of some of the ideas people had. Hope it inspires you! As another adult dancer, let me say first that your dress is beautiful and suits you well! As to bling- I would go with one layer of clear stones at the belt line. 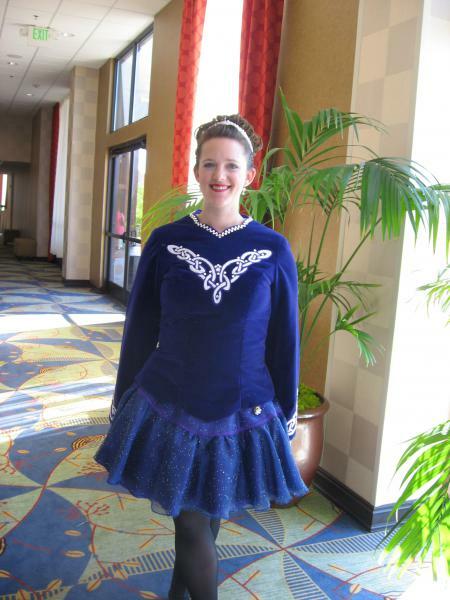 I would also do a scattering of the blue stones on the skirt. Keep them small and keep the scatter light for now- you can always add more later. Can you post a close up of the embroidery so we can see the small crystals better? Might have more ideas from there. A friend is borrowing it this week, since I'm not dancing. I'll post close ups of the ebmroidery when I get it back. I really like the second picture that Hop123 posted, with the larger stones with the smaller stones above. What do you guys think? How much larger should the larger stones be? The stones I have around the neckline are 30s. I think the second picture looked best too. I would also still add a few blue stone scattered to give it that extra bling. I would use 40ss as the smaller stone and a sew-on rivoli as the larger stone. Measure your number holder and go with a sew-on slightly smaller. 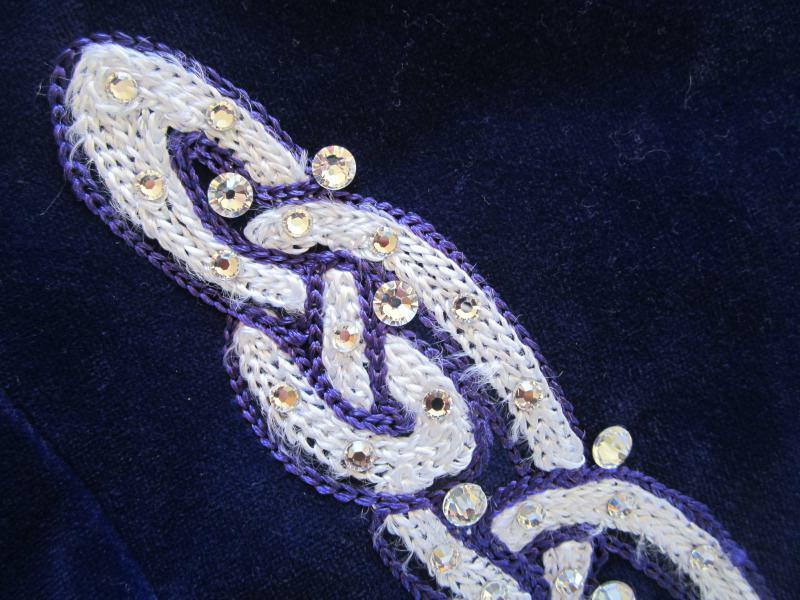 here is a close up of the embroidery with the smaller stones, along with a mock up of the belt. The larger circles are slightly smaller than a dime, and the smaller crystals are the 34ss that I have on the neckline. edit- looking at hop123's picture, I see she put more of the smaller stones. I think I'd half the distance between the smaller stones that what I posted. I would recommend adding crystals to the bottom of the bodice. In a picture you added, I love the smaller band of crystals on top of the larger band. My idea would maybe be to lightly scatter blue crystals throughout the rest of the bodice? 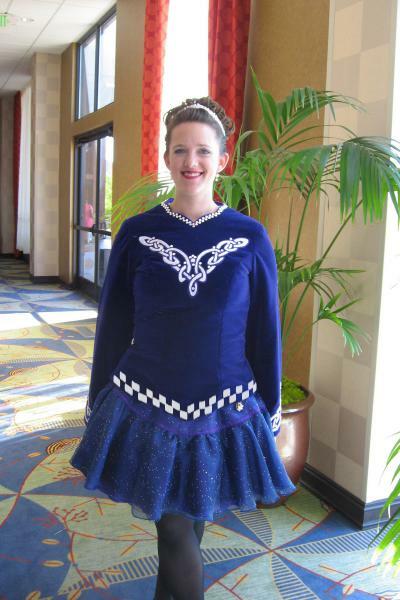 if you're hesitant to adding too much since you want to bling it up again in Prelims, I would do the belt- On my dresses, I've never had the belt of crystals going all the way around- mostly just because my dresses were always the perfect length in the front, but I always had issues with length in the back- best to leave it clear in case of any future alterations (where as on the front, it's a lot easier to deal with). Perhaps, instead of scattering crystals all along your bodice (Since you're saying you're not quite ready for that) I would just scatter a couple on your skirt, both front and back. Also, taking a nice look at the photo, I noticed you have embroidery on the sleeve- I would add a cuff of crystals to the sleeves too- i know judges don't see them, but for some reason, they really add to the overall look of the dress. I would just do one row and leave about an inch in between the crystals and the hem of the sleeve. but in addition to that, maybe just a couple more crystals along the embroidery on the bodice (particularly the bottom portion of it- it looks a little bare), and I'd say you've got an even more updated blinged out version of your little blue number! Beautiful dress simple and clean! I would add more stones around the dropped waist to add a little extra bling! 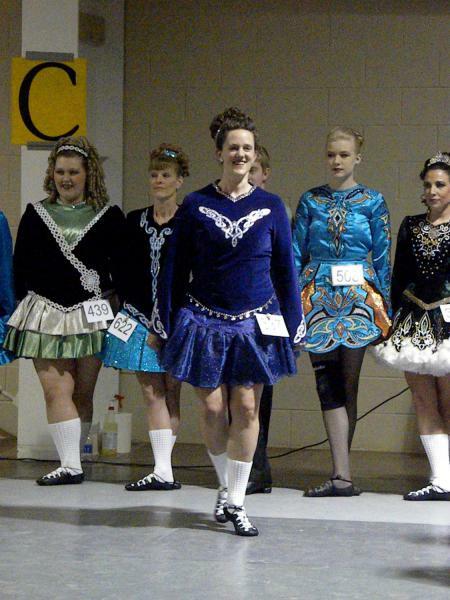 I added the belt just before this weekend's feis. What do you think? Looks great are those all adult dancers behind you? What region do you dance in?